This holiday season the Greater Park Hill Food Ban k will be providing meals to hundreds of families, including many from our own school community. In our ongoing commitment to support the Greater Park Hill Foodbank, and to help them prepare for the holidays, we will be collecting canned foods and dry goods in a red wagon (see picture) located in the hallway outside the cafeteria. All help is welcome and appreciated…even if you are only able to help out for 30 minutes. Please email Beverly at Beverly_Thurman-Baldwin@dpsk12.org to let her know when you can help. The ONLINE book fair will be open Friday, November 16 – Monday, December 3. Click HERE to order your books online. Please contact Erika Gipson at erikagipson@yahoo.com for volunteer opportunities or questions. Please join our Spanish-speaking (and Spanish-learning) community at Mezcal on Thursday, November 29 from 6:30 pm – 8:30 pm. There will be drink and food specials and lots of interesting people looking to chat in Spanish. Whether Spanish is your first language, you spent a year abroad in college or you are just learning, please come celebrate the diversity of our community and this splendid language. This is not a fundraiser, but we are all a little richer when we connect with new people in our school community. Shhhhhhhh…..the secret password is…..coming soon. Park Hill Peeps! 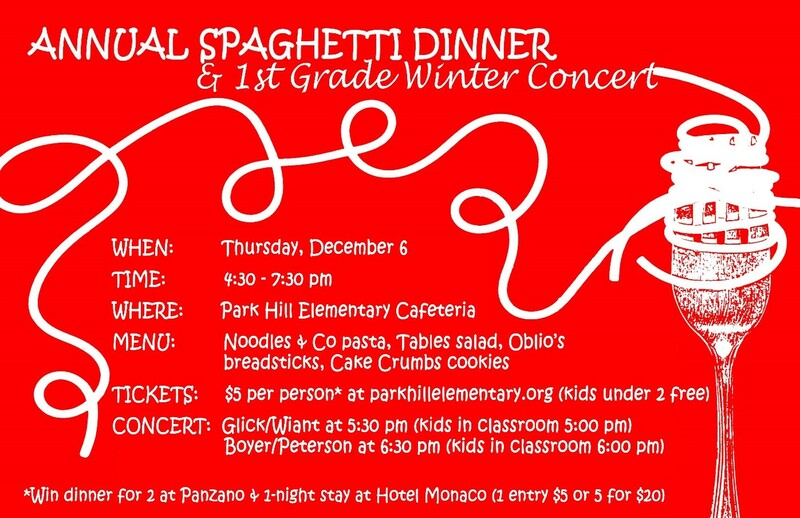 Save the date for our annual I Heart Park Hill Auction!! This year, our auction will be FRIDAY (yes, FRIDAY), February 22, 2019! This festive soirée will be happening at Park Hill’s latest and greatest, but super-secret speakeasy. Shhhhhhhh…. Not only is this our school’s biggest and best party of the year, but it is the most important fundraiser for PHE. This adults-only revelry is FREE to attend and open to our entire community, so please invite your friends, family, and neighbors. Our goal is to raise $100,000 this year, and we are counting on you to help us get there! 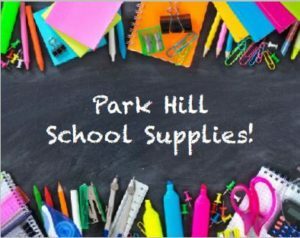 All proceeds directly benefit Park Hill Elementary, and every dollar goes towards critical programs and resources for our students. Paraprofessional hours, math and literacy specialists, computers and technology, our school nurse, and crossing guards are just some examples of how our raised dollars positively impact our school. We need to bridge the gap of funds received from DPS and what our school requires. 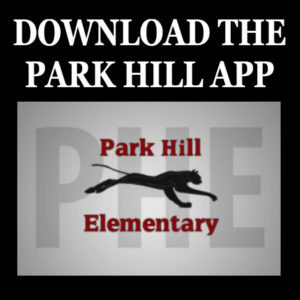 Please support our auction and help keep Park Hill strong! How can you help? Class baskets are a big part of our auction (thank you, Brooke Chesebro! ), and you should have received an e-mail from your room parent about your basket theme. We challenge you to top last year’s baskets, which were creative, generous, and full of spirit (in many cases, literally!). We hope we have a repeat year of amazing baskets, so thank you in advance! Buy-A-Share Parties are vital to our auction and our school community. Not only do they encourage mingling with fellow parents, but they raise a lot of dollars and are a blast! Please talk with your friends and consider hosting a Buy-A-Share with a theme of your choice, or we can help you choose a theme. Contact Marcy Eastman (marcy@myrealtycolorado.com) for more information and/or to express your interest. Silent Auction Items are needed for our, you know, silent auction. But what we need specifically at this time are great getaways (mountain houses, vacation homes, etc. 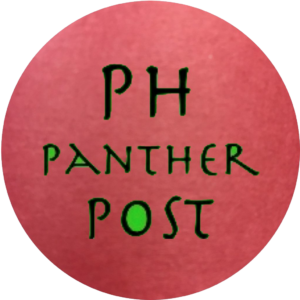 ), professional sports/theater/concert tickets, and experiences (the cooler, the better). Please network with your co-workers, family, and friends and ask for donations. We are a 501c3 and all donations are tax deductible. Please contact Carrie Brumbaugh (cvolson@hotmail.com) with any items you wish to donate! Visit http://iheartparkhill.com/XMfMM/ for more information. Until then, save the date and start dreaming up that 20’s attire, if you so desire! It will be a roaring good time! The Choice process is quickly approaching, and I know that you have many questions regarding middle school options. As your principal, one of my responsibilities is to provide you with as much information as possible to guide you in selecting the right middle school for your child. Please join me on Tuesday, December 4, 2018, from 5:15 pm – 6:30 pm to hear an overview of the Choice process and to meet representatives from neighboring middle schools. The night will begin in the auditorium with a review of information and timelines regarding the Choice process. 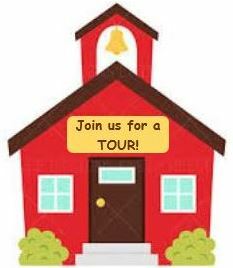 Following that, you will have the opportunity to visit with representatives from local middle schools, ask questions, and learn more about your options. Please call the main office @ 720-424-4910 to RSVP if you plan to attend. 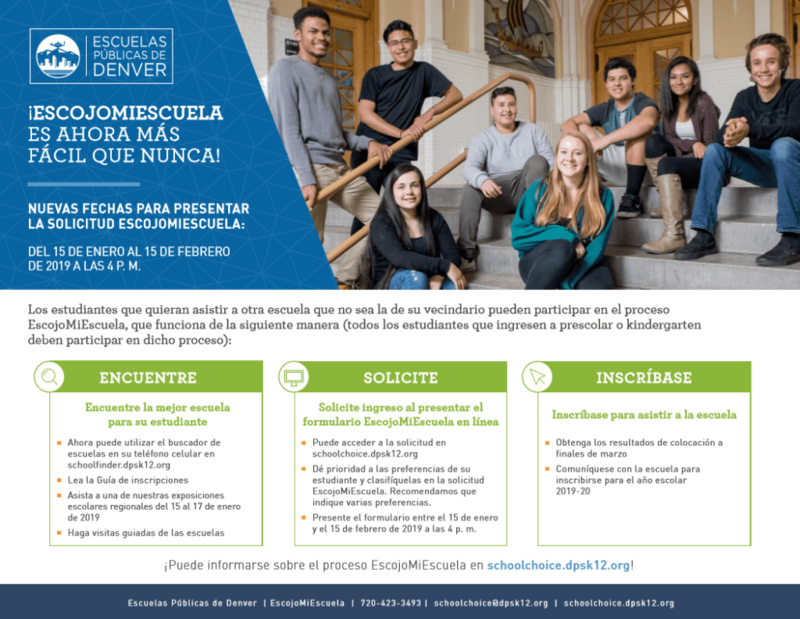 Denver School of the Arts – If your Fifth Grade student is interested in previewing DSA, or auditioning for the 2019/2020 school year, go to http://dsa.dpsk12.org/visitation/ to sign up. See our Community Board for more information. 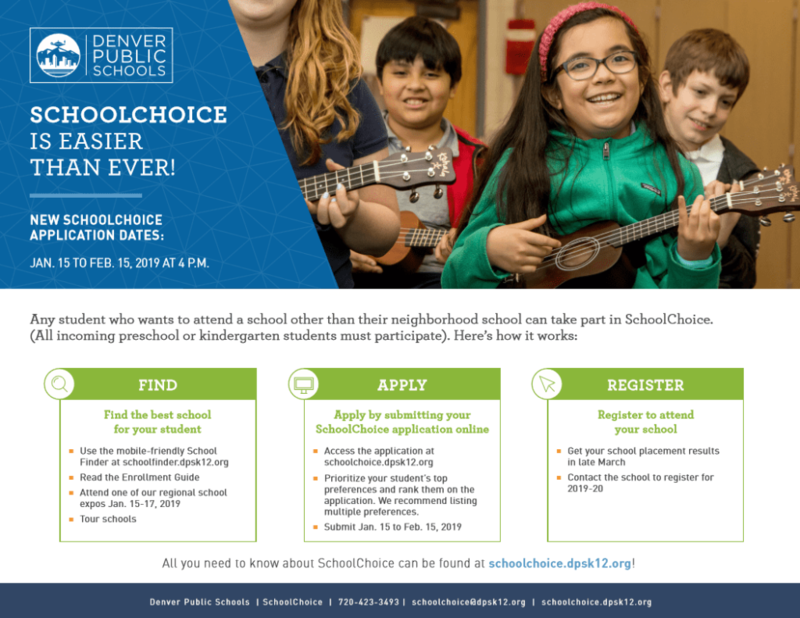 January 15 – February 15: 2019 – 2020 SchoolChoice Window – This effects all ECE students, incoming Kindergarten students, all Fifth Graders moving to Sixth Grade and anyone wishing to change schools.